Ever notice shoppers in the grocery produce section shamelessly thumping the watermelons, the pumpkins, the cantaloupes, searching for the perfect melon—that one piece of fruit that sounds just right? 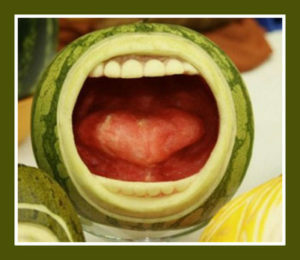 What do fruit and vegetables have to do with singing? Quite a bit, as it turns out. Our quest for good vocal technique includes a search for the perfect place to focus the tone as it leaves the body. Think about the large resonating soundboard that is built into an acoustic piano to temper and amplify the rich piano sound. As a singer, you can choose to direct your voice to resonate against a specific soundboard before it exits your body. You can direct the flow of sound to the nose (bluegrass), the throat (blues), the chest (Broadway), or the sinus cavities in the face, often called the “mask” by many classical singers. I recommend the head as my preferred resonance location. 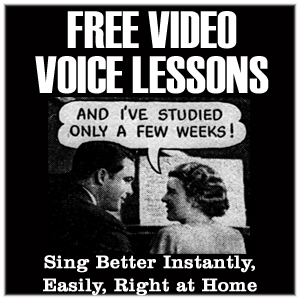 This does not mean the same thing as using your head voice to sing. It means using the resonance in your voice to define your sound. Melons have much in common with the human head. Both have a thick semi-solid shell that surrounds a mass of mostly liquid soft tissue matter. Both resonate when they are thumped. There’s a kind of “sweet spot” where you can feel concentrated vibrations, even from neighboring areas. To find that spot, you’re going to have to use a little imagination—and everything you’ve already learned about breathing and support. Using a buzzy ZZ sound, locate your personal resonant soundboard right there at the top of your head, where a baby’s “soft spot” or fontanel is located. It’s the last place an infant’s skull bones meet to grow together. You probably have a cowlick there. Now take a leap of faith and imagine you are lifting the tone with your scalp muscles. Wiggle the ZZ to keep it flexible. Try to feel that you are energetically stretching your cowlick skyward. Keep the sound circling in constant motion so it retains flexibility and true pitch. Don’t let the vibrations drop below the lifted surface of your scalp. Instead, feel free to raise your eyebrows to assist with the lifting. Next feel the back of your tongue rise to meet the sweet spot. You may be surprised to notice that stretching up your eyebrows helps kick in your lower body support. Try these two locator exercises, first in your speaking voice, then on random notes up and down the scale. Nah-gah-noo Nah-gah-nee; Dah-gah-doo Dah-gah-dee. Then, while the sensations are still fresh, transfer to a line in the song you are singing, right at the point of lift. When you begin to lose the buzzy sensation, refresh it by returning to these exercises. Good “melon-y” resonance in the head is essential to creating a complex, layered tone. It puts spin and signature on your sound. Aim for a warm rich resonant tone, but try to keep a little edge on your vocal tone too. Always assume you are not stretching nearly high enough. If you enjoyed this article I’d love to hear your questions or comments! Very helpful thank you Renee! Well. I’ve been called a Potato Head on numerous occasions. So. I guess melon head isn’t a far stretch. Miss all y’all Renee and Company. MERRY CHRISTMAS. ha! Merry Christmas to you and your family Michael! Love this! You are such an inspiration Renee, thank you so much! thank you Christie, so glad you enjoyed it!